Ridley Road Shopping Village. Photograph: Google. 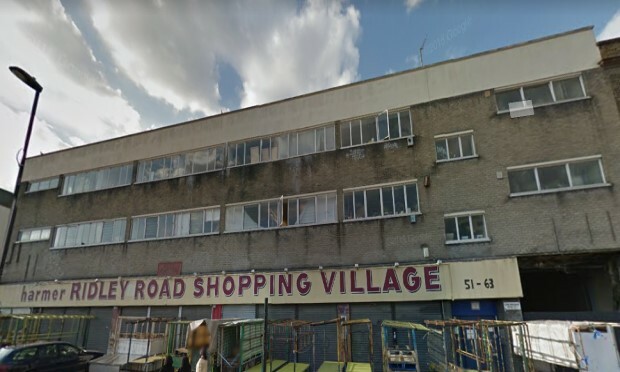 A celebratory festival fighting for the “heart, soul and spirit of Hackney” over the future of the Ridley Road Shopping Village is to take place on 30 March in Gillett Square. Offshore company Larochette Real Estate has submitted a planning application for new retail and commercial premises and luxury flats, which would result in the loss of the majority of the market stalls and artists’ studios currently in the building. Occupants have been locked in a struggle to remain in their home since October, when the council moved to support traders in the Shopping Village after they were handed a two-week eviction notice by their landlords. Artist Andrew Palmer, who occupies one of the Ridley Road studios, said: “If this development plan is given planning permission the character, ethnic cultural diversity, will be carved up and undermined to the point it will be unrecognisable as the incredible space is currently is. “Ridley Road couldn’t better represent the incredible cultural diversity in Hackney and is a place that truly brings people together on a day to day basis. “This development poses a fight for the heart, soul and spirit of Hackney. Residents in the borough need to know the true social impact this development and its inevitable damaging consequences it will bring. The Town Hall stepped in to meet with developer representative Rainbow Properties in October, and has since pledged an over-£1 million investment for new facilities for market traders and improving the street environment for traders, customers and the wider community. However, Cllr Guy Nicholson (Lab, Homerton), cabinet member for business, planning and investment, admits the Town Hall has “limited powers to force change on other people and the properties they own”. Traders were subsequently handed contentious licenses in November by Rainbow, on pain of eviction on non-compliance. Cllr Nicholson said: “Both the Mayor and myself met the owners to directly voice our concerns and those of tenants and local people, about the suddenness and short notice given to leave, and the impact this would have on local businesses and Dalston’s economy. “This helped to halt the immediate evictions and encouraged the owners to take a more measured approach. We also made sure that the council was on the ground to provide ongoing support for the affected businesses. “The council has limited powers to control or force change on other people and the properties they own. But it can protect what it owns and it can use the limited powers it has to influence and shape regeneration so change can add value to local communities and businesses, and not brush everyone aside. The 30 March event will raise funds for the legal defence of the Shopping Village traders.